Here are a few things that I have been loving lately. 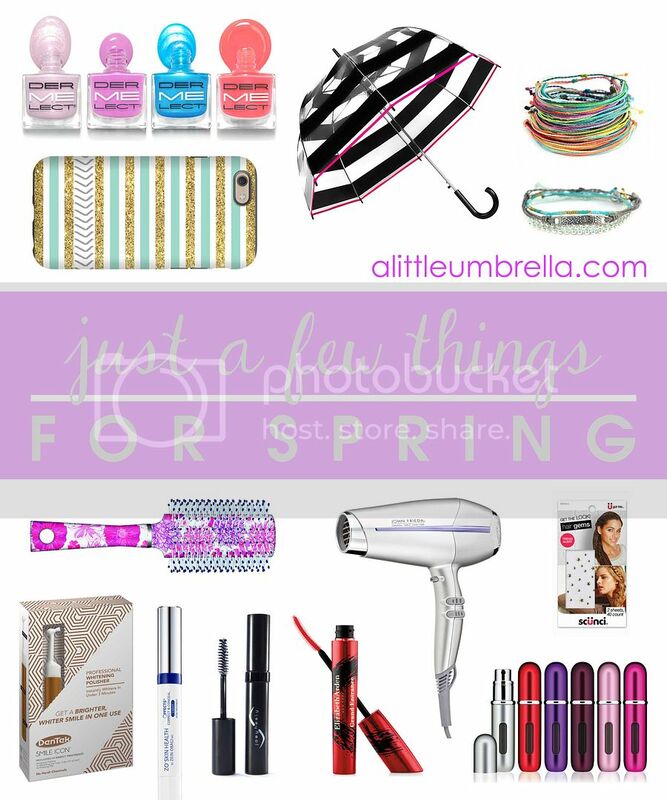 I decided to call it just a few things for spring! I tried to rhyme just there, but it doesn't really work. Oh well, you get the idea. So let's get this started! First let's talk about nails. These are two of the prettiest springiest shades I have ever seen! The Dermelect Cosmeceuticals Spring 2016 “ME” Outburst Nail Collection features an exciting palette, ranging from soft hues to bright statements. Dermelect’s latest peptide-infused nail lacquers instantly evoke a sense of renewal by energizing the season’s most exuberant colors. The two shades I swatched were unscripted (an energetic violet) and explosive (a neon coral). I mean how gorgeous are these for spring?! Love these. So you wouldn't think that you could get compliments on an umbrella. But thanks to the rain in Ohio lately, I have. The Maddy Bubble Auto Open Umbrella is perhaps a perfect dome umbrella. You can see out, but rain can't get in. Nothing protects you (and your hair) better than a bubble umbrella! It is so simple to open too. Just a click and you are on your way. Don’t let a few drops of rain put a damper on your style. 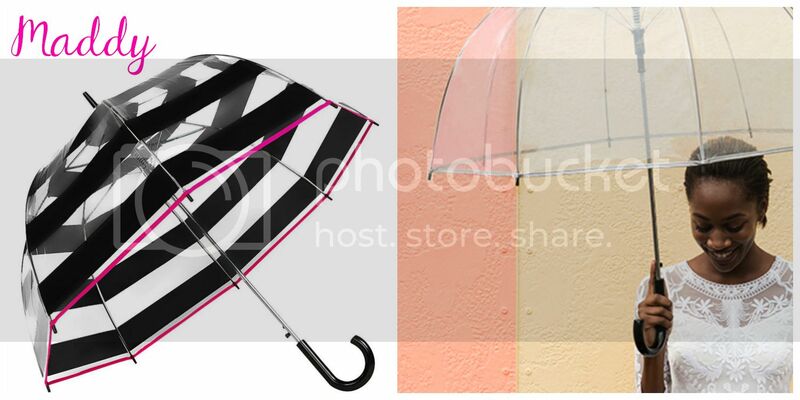 ShedRain makes it easy to top your look off with a fashionable umbrella on those rainy days. The Spring/Summer 2016 collection, draws inspiration from the style makers of the world - from the runways of Paris, London, and New York to the chic trend setters on the streets. Check out all of the cute styles! My next pick makes traveling with your favorite fragrance simple. The Classic HD Travalo allows travelers to refill their perfume atomizer directly from a standard perfume bottle through a patented Genie-S pump-fill system. This means that your fragrance will never contaminated by exposure to the air. 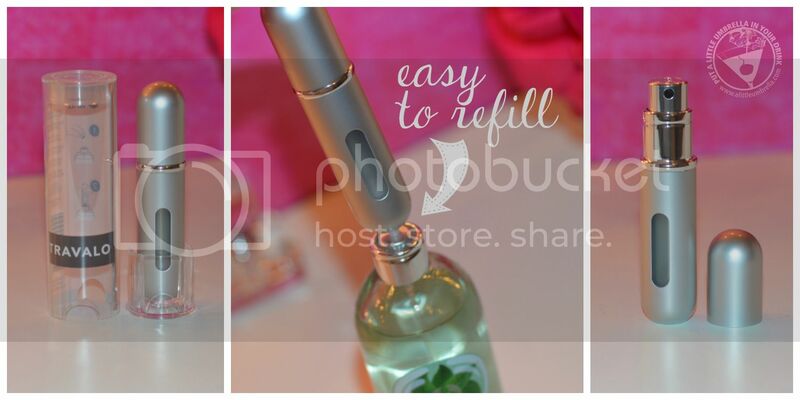 It just decants magically from one sealed bottle into the leak proof atomizer in a few seconds. This TSA Approved travel must-have holds 5ml of fragrance. That's 65 sprays! Pack it for your next trip or keep it in your handbag for an anytime touch up! Pura Vida Bracelets are not only super cute, every bracelet purchased helps provide full time jobs for local artisans in Costa Rica! The perfect spring and summer accessory, all of the Pura Vida Bracelets are carefully handcrafted by artisans in Costa Rica. The commitment to their craft is conveyed through the quality of their work. The artisan’s dedication to the pura vida way of life is demonstrated in the seemingly endless color combinations and innovative styles. Each bracelet is as unique as the person wearing it. 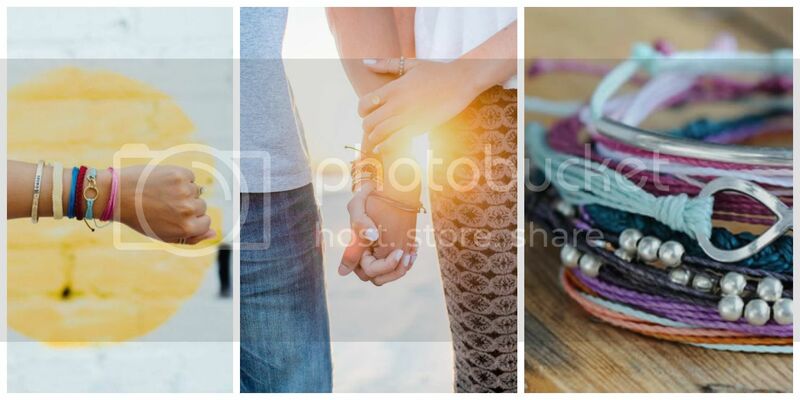 Wear Pura Vida Bracelets together or combine with other jewelry to create the perfect look. I received two packs of bracelets. The Friendship Pack (above left) contains a whopping ten bracelets! Save some cash by purchasing bracelets in this custom style pack that is made up of ten best-selling originals! Wear them all together or mix and match your favorite combinations. Every bracelet is 100% waterproof. Go surf, snowboard, or even take a shower with them on. Wearing your bracelets every day only enhances the natural look and feel. The other pack that I received is the Bahama Breeze Pack (above right). Get lost in the gorgeous colors! This trio includes the following bracelets: Silver Track Bead Seafoam, Silver Hammered Flat Bar Dark Grey, and Seed Bead Tides. This set is so pretty! It reminds me so much of the beachy way of life. Get lost browsing all of the bracelet choices. You can even purchase them one at a time for as low as $5! I love the philosophy behind this brand. The bracelets are even easy to adjust to fit your wrist! My next pick is one of the best mascaras I have tried lately. Elizabeth Arden Grand Entrance Mascara has a glossy, long-wear and water resistant formula that effortlessly coats lashes to separate, extend and intensify their appearance. The result? All-day lift and curl that won't flake, smudge or dry out. 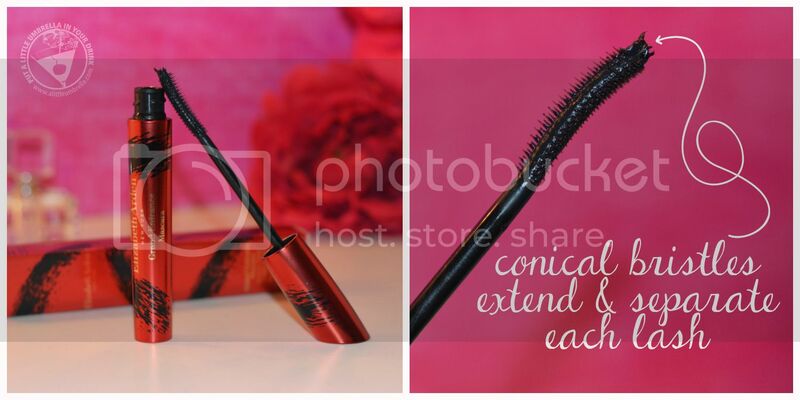 Both the brush and the formula coat my lashes without being clumpy. I love the smooth separation and mega extension that I get with this mascara. 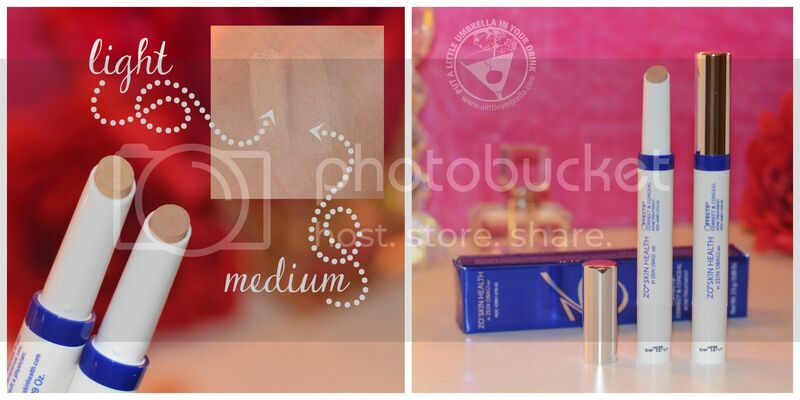 This new offering from Elizabeth Arden is available at Beauty Brands. Now that your lashes look great, you want your brows to look just as fantastic. Groom unruly brow hairs into submission with the Brow Structure Clear Set from Joey Healy. 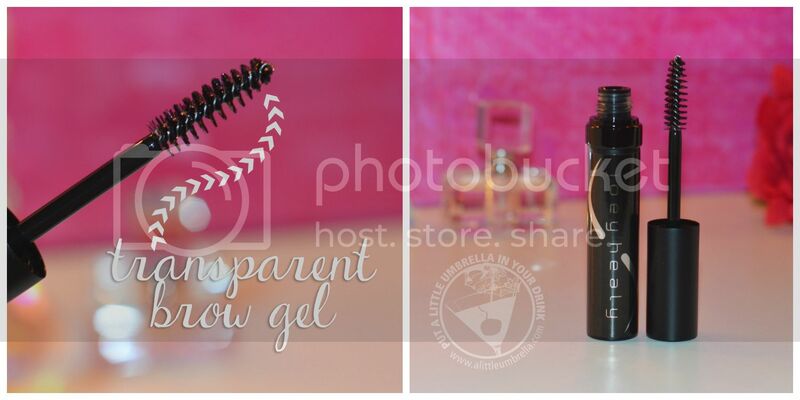 This water resistant, transparent brow gel provides natural definition while setting eyebrow hair into place. I love using this as a finishing touch once I have applied my makeup. The expert formula leaves eyebrows pliable, never crispy, and will not disturb your brow makeup underneath. This is one of those products that you never knew you needed until you try it. It makes such a difference to have your brows smoothed to perfection! The spiral brush lifts hairs into place while providing just the right amount of healthy shine and grooming. 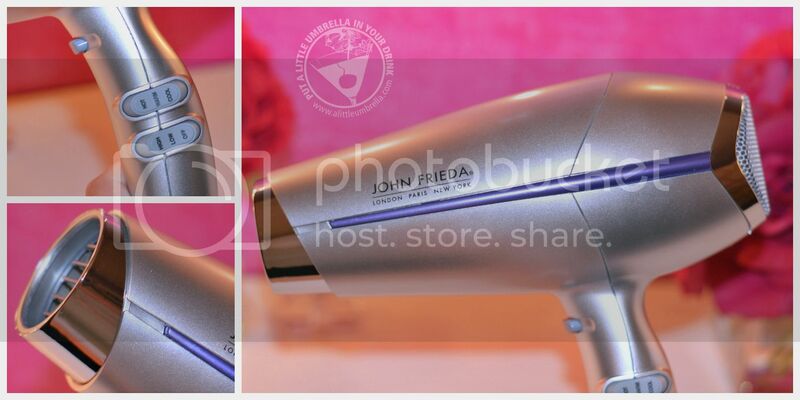 Add volume and body to your hair with this full-volume hair dryer from John Frieda. It features three heat settings and a cold-shot option to give you the right temperature for any type of hair. The John Frieda Full Volume Dryer gives you 1875 watts of power, a lightweight AC motor, and a high wattage advanced ionic generator! I love the volume and shine that I get from this hair dryer. Speaking of John Frieda, did you know that vlogger Blair Fowler has joined it’s House of Experts?! Perhaps you saw her race with her dad on the Amazing Race! Blair is now part of a group of haircare authorities who collaborate to maintain salon quality formulas and help consumers navigate the line. How cool is that?! I love how John Frieda is expanding what it means to be an expert. Is your skin breaking out? Sometimes my skin starts getting fussy when the weather starts to change. It is the perfect time to try this targeted spot treatment that attacks acne while concealing blemishes, erasing visible signs of acne. Correct & Conceal from ZO Skin Health‏ is available in two shades - light and medium. The 2-in-1 product is first a soft focus concealer that provides an instant, natural, long-lasting matte coverage. Second, it is also a maximum strength acne medication that treats and prevents acne on the surface of the skin and within the pore! This stuff is just what I have been looking for. It is the product that you want when those blemishes start to form. Conceal and heal in one easy step! Looking to upgrade your case for spring? 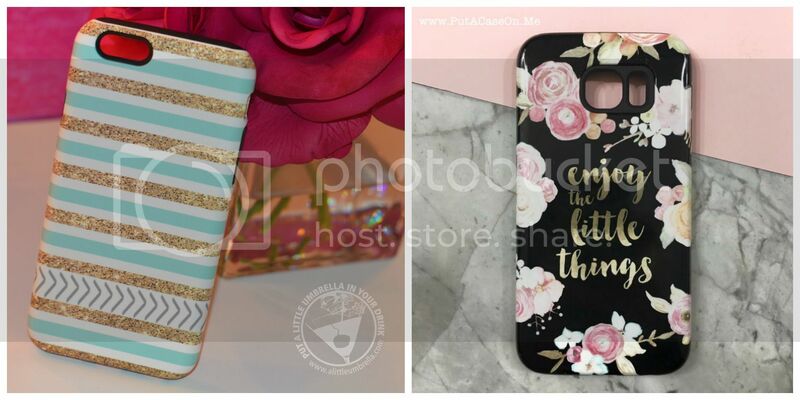 PutACaseOn.me offers customized phone cases for iPhone, iPad and Galaxy devices. They have modern designs to help inspire ideas for your new case. Go for something monogrammed, use your own photo, or choose from one of the many designs on the site. 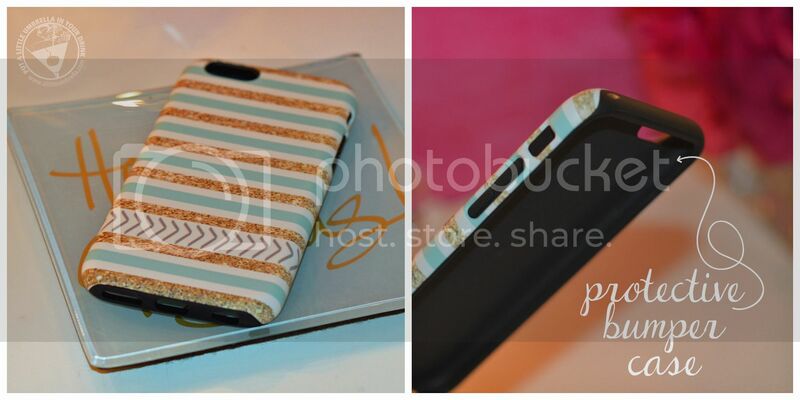 That is what I did when I chose this Gold and Tiffany Extra Protective Bumper Case. I love the combination of gold sparkles and tiffany blue. The tough bumper case features a two-piece design with an inner rubber core to provide additional shock protection. Inside of the case there is a black bumper. It is rubberized and it fits the phone very snug. Then there is the decorated case itself which fits over the black bumper. The bumper cases wrap the entire device and provide maximum protection from drops and scratches. I was impressed with how protective the phone case feels. The only problem I ran into was my screen protector. I have a thick glass screen protector that goes right to the edge of my phone. This case is so snug that it started to lift up the glass. If you don't have an edge to edge glass screen, you won't have to worry about that. The cases also come in a slim one piece design that full wraps the device providing protection against scratches and light drops. It was easy to create my case and easy to install it as well. 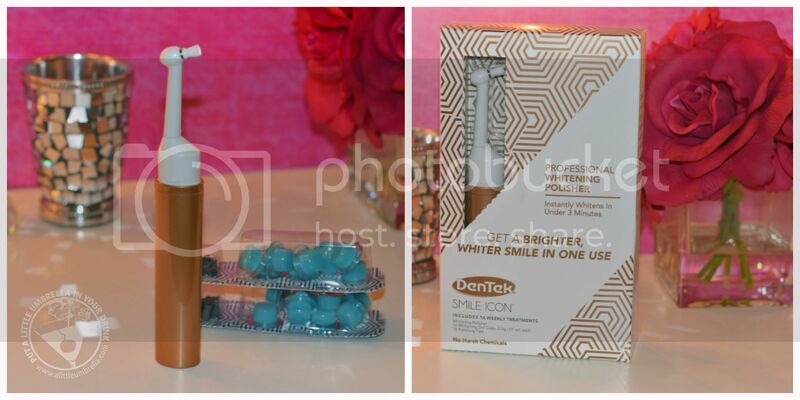 The DenTek teeth whitening polisher is an affordable and easy way to whiten your teeth. It goes beyond brushing, messy/time-consuming strips, and gels to whiten and brighten your teeth. Use it to remove grime and surface stains without peroxide or harsh chemicals! The kit includes 16 weekly treatments. Using a bristle-free flexible polishing tip, it applies the whitening gel evenly and thoroughly. Start now and you will have a bright smile through the summer! Finally, I have some fun picks for your hair. The Conair Impressions round hair brush features a round barrel for smoothing and straightening coarse, curly or wavy hair. 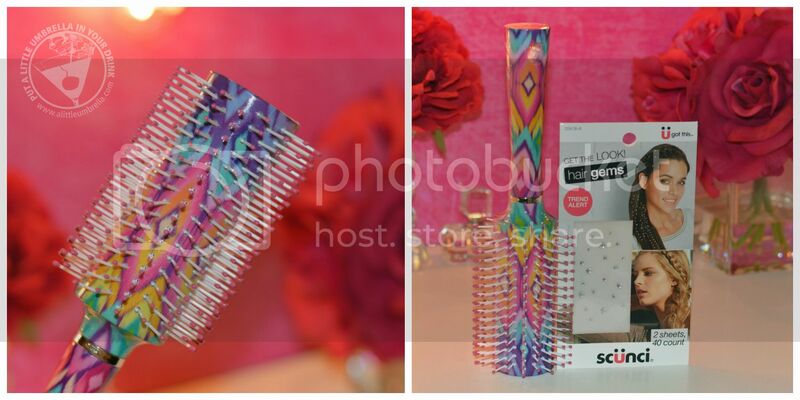 The bristles will help shape and polish your spring styles. Want to glam things up? Get sparkly with scünci’s hair gems. In just four seconds, you’ll go from bland to glam for a night out on the town. How much would a tween love playing with these? !